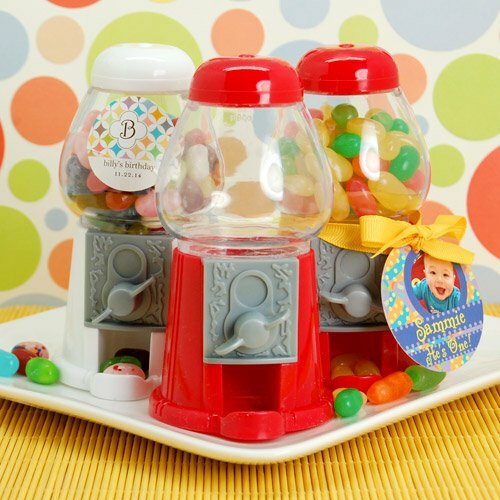 These little gumball machines are a great gift to hand out for showers, weddings, birthdays. They are easy to fill and despence. Can't wait to give them out at my shower. These little gumballs machines are so adorable. I got them for my guest for my Adoption Shower and everyone Loved them. This is a very cute item however we were disappointed to see how tiny they are when they arrived. Considering the price I expected them to be much bigger. The gumball machine is interesting and entertaining item for a surprise birthday party. It fits perfectly with a summer Screen-on-the Green movie night. It reminds one of days gone by. Hopefully, it will remind my 21 year old of a simpler time. Great gift! Kids loved them! Perfect favor for my daughter's Candyland celebration! These were extremely cute. I gave these to the young kids, I didn't want the gum balls so I filled them up with colorful candy and they looked super cute. I wrapped it with cellophane. The kids just loved it. I used these gumball machines for my daughter's candy themed Sweet 16 party. I filled them with colorful chocolate mints and they were a huge hit! They actually work!! miniature gumball machines really work! I found these by accident and figured I would order these for my daughter's 6th birthday party. The order came quickly. They are so cute and surprisingly for how small the look they can hold a lot of candy! Can't wait to give these away to the kids! Cant wait to give these as thank you gifts for my 3yr olds party i bought red and white it was shipped nicely and just the right size for the kids who will receive them. Love my mini gumball machines!! This was the ideal party favor for my 4 year old sons party!! It was the right size not to big not to small and parents loved it too!!! This mini gumball machine was a hit at my baby's 1st bday party! 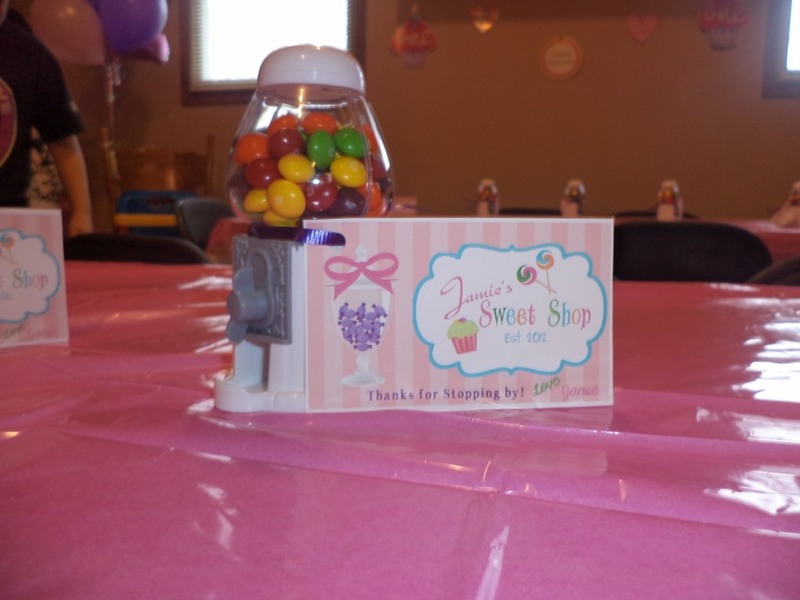 I filled them with skittles and tied a personalized tag around them and placed them down the center of the tables. I thought only the kids would take them, but the adult guests were the ones fighting over them! I used this product for my daughter's Christening! We bought the white Gumball and it was a hit! We used these for my 10 year-old son's adoption finalization party. We put Jelly Bellies in them. All the kids (and adults:) loved them. They were absolutely perfect party favors. A couple feel apart when we were filling them, but they were easy to reassemble. I used the gumball machines for my wedding favors....they were a HIT!!!! Everybody loved them. The shipping was fast, packing was great, there were no cracked or broken ones. I loved them, I would recommend this site to any upcoming brides!! I am putting red,white and blue candy in it for my patriotic party with a gift tag to say "Thank you for coming"
Q:What other candies can you put in here? 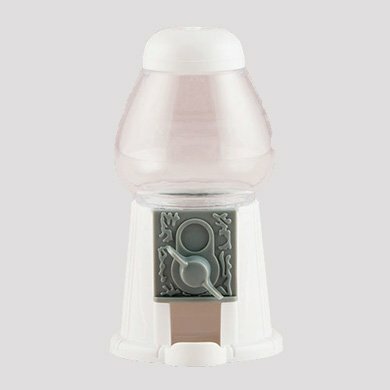 Q:hi i was after 12 of the mini empty gumball machines, however I was wondering if I can get them in the colours of the mini classic gumball machine # 1660. And also if I can get a mix of colours or if they have to be the one colour. 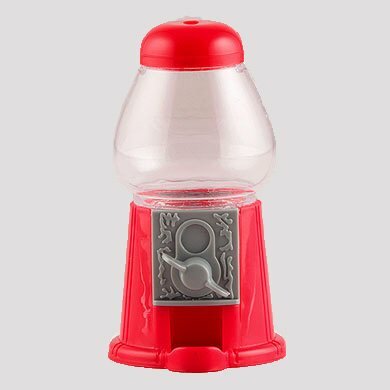 I was also after the mini candy dispenser with scoop (double, qty 1) # 1794. it says that you are currently out of stock, I was wondering when you may be getting these back in stock?? A:The empty gumball machines are only available in red and white as shown. There is a minimum order of 4 per color. Unfortunately we currently do not have an estimated restock date for the double candy dispensers. I'm aware that the height of the machine is 5inch. Can I also check what this the specification for the portion which we put the gumball because I want to do a customization sticker to be paste on the gumball machine. A:They are 2" at the widest part. Q:Will 1 inch gumballs fit? If not, what is the maximum size candy that will fit? A:1" gumballs will be too big for the machines. We recommend 1/2" gumballs for them. Q:Can M&M's fit in the dispenser? and if so how many ounces of canyd? A:M&M's can fit in the dispenser but are not the same size as a gumball so more than 1 M&M would come out at a time. Each can hold 1.75oz of candy. Q:How many ounces of candy can the gumball machine hold? Q:Are they the same size as the ones filled with gumballs? A:Yes, this item is the same size as the filled gumball machines. Q:Are the gumball machines glass or plastic? A:The gumball machines are made of plastic. For an added twist, fill with jordan almonds, mini candy pearls or personalized mint chocolate candy.